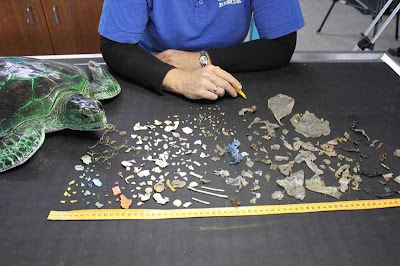 A green sea turtle has been found dead on a New South Wales beach with 317 pieces of plastic in its digestive system. The turtle was found washed up at Ballina, in the state's north, earlier this month. Australian Seabird Rescue spokeswoman Rochelle Ferris says it is the most shocking case she has seen in 15 years. She says there is no doubt the plastic killed the animal. "We see 40 or 50 sea turtles each year that are suffering from plastic ingestion," Ms Ferris said. "This is definitely an extreme of that, but we're only looking at 250 kilometres of coastline. "There's a million turtles out there on the Barrier Reef of this species and I have no doubt there are more out there in this condition. I understand the complexities of this issue... but the governments are going to have to increase regulation of the waste treatment that's coming out of urban areas."